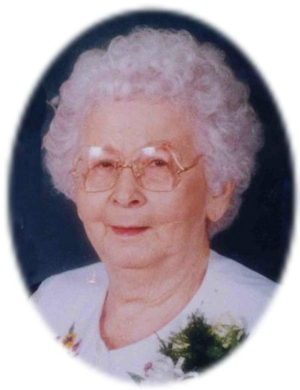 Obituary – Ingmire, Mary Elizabeth (McKinney) « Perry High School Alumni Association, Inc.
Mary E. Bartow Ingmire, 93, of Perry, Oklahoma was born June 6, 1915 in El Reno, Oklahoma and died Wednesday, June 11, 2008 at Green Valley Nursing Home in Perry. Born Arlean Esther Freeman, she was the third youngest child in her family. After her parents divorced, Arlean and three of her siblings were placed in an orphanage in Oklahoma City, Oklahoma. Her name was changed to Mary Elizabeth McKinney in 1926 when she was adopted by Melvin Willis and Anna McKinney of Perry, Oklahoma. Mary was a 1933 graduate of Perry High School. On July 30, 1939, she and Byron B. Bartow were married in Perry. They were parents of three daughters, Arlean, Iva and Opal. Her husband, Byron, died on May 13, 1977. Mary was employed at Scovill Tire Supply in Perry from 1951-53. She was a receptionist and bookkeeper for Dr. A.M. Brown at Perry Medical Clinic from 1953 until 1976. She and her husband, Byron, owned and operated Bartow’s Cafeacute; formerly Forney’s from 1959-1963 and the Sonic Drive-In in Perry from 1963-1969. In 1976, she opened the Paradise Day Care Center which she operated until 1978. Later, Mary became a home healthcare employee and provided compassionate loving care. She and William Forest Ingmire were married on February 16, 1979 in Perry. He preceded her in death in 1986. Mary was a member of the First United Methodist Church and had been active in the Noble County Family YMCA. She loved to cook for her family. Funeral services will be at 10:00 a.m. Monday, June 16, 2008 at the First United Methodist Church in Perry. Rev. Marilyn Weathers will officiate. Interment will be in Grace Hill Cemetery at Perry. Services are under the direction of Brown-Dugger Funeral Home. Memorials may be made to the Alzheimer’s Association in care of Brown-Dugger Funeral Home, 1010 N. 7th Street, Perry, Oklahoma 73077. Mary is survived by three daughters, Opal Yockey and Iva Roth, both of Perry, Oklahoma and Arlean Jones, of Bedford, Texas; six grandchildren and one brother, Aubrey Freeman, of Pryor, Oklahoma. In addition to her first and second husbands, she was preceded in death by her parents, one grandson, Clem Yockey; and one granddaughter, Belinda Beth Burk.